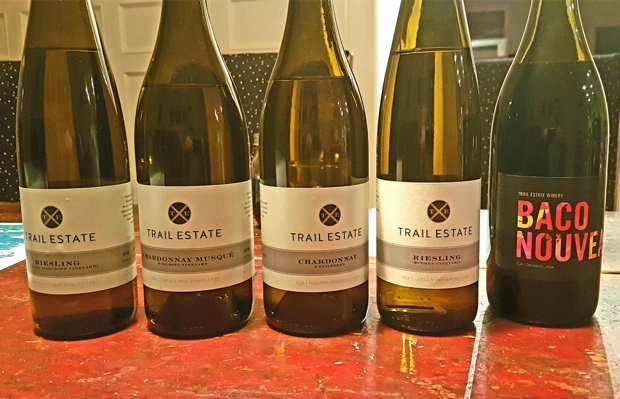 It was December of 2016 when I last sat down to taste with Mackenzie Brisbois of Trail Estate Winery. 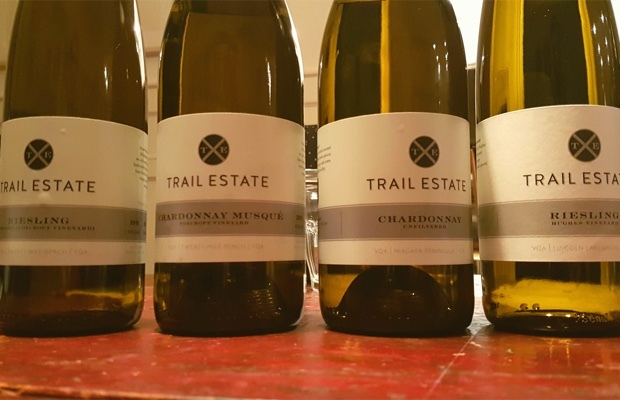 With the first year anniversary of her inaugaral wine release having recently passed and the 2017 (Prince Edward) County in the City tasting coming up this Thursday, it seems as good a time as ever to revisit and publish my tasting notes on her multifarious ’15s. I had previously tasted a 2015 group of skin-contact riesling and sauvignon blanc in April 2016. Brisbois’ concentration bordering on infatuation incites a summons to contest with the fruit reaped out of two Niagara vineyards, one farmed by Ed Hughes on the Lincoln Lakeshore and the other by Craig Wismer from his Wismer Vineyards Foxtrot Block on the Twenty Mile Bench. While time develops Trail Estate’s plantings in Prince Edward County and the fruit that will eventually come, these iconic Niagara Peninsula plots more than suffice and for what Trail Estate needs to say today. In fact I don’t envision Mack Brisbois moving on from these two sites any time soon, what with her triumvirate expressions focused on skin contact, wild ferments and barrel aging. It seems that riesling, chardonnay and sauvignon blanc, these vineyards and the Brisbois experimental style were all made for one another. Which elicits my response to the question you are chomping at the bit to ask. Come on I know it’s what you are thinking. Why are these wines so expensive? Why pay $25-$35 for Niagara fruit bottled in Prince Edward County? Why pay a premium for speculative and probationary wines from a small up and coming estate not yet on the commercial radar? For any Ontario wine for that matter? These are all good, valid and ignorant questions. First of all, these wines are made in minuscule quantities by a small group of passionate, risk-taking, acumen-exceptional people. The fruit is expensive, whether it travels three hours east from Niagara or not. Great winemakers to be have to hone their craft on something while they wait for their own gardens to grow. A rock star in waiting will earn stripes by purchasing fruit and turning water in wine. Most important to remember is the honesty of what’s inside their bottles, how in spite of their experimental nature they are so f-in clean, pure and drinkable. It’s also amazing to note that Brisbois is fully cognizant (and readily forthright) about the mistakes she made (and allowed others to make) in growing, fermenting and finishing these wines and how she would correct them going forward. These wines represent just the tip of her proverbial winemaking iceberg, of what’s to come when she gets really, really good at this. Not that she isn’t already but risks, mistakes and epiphanies will all combine and conspire to lead her and her labels to greatness. Are you reading me? Here are the six wines tasted with Brisbois on that early winter’s day. Not bottled yet, this mason jar barrel sample is from a Wismer single-vineyard (Foxcroft). It will be pulled from (one new of six and the rest 13s and 14s) barrels this coming week but as of yet unsulphured it already has that slightly sulphured and coarse filtered feeling. Beautiful dark fruit has aromatically blossomed from being open a few days and this really speaks of of that rarely achieved Niagara cabernet franc imposiibility. Soil-clay funky, so pure and precise. Carries that feign of sweetness, low alcohol, depth but so not heavy and plenty of spice. There will be 100-120 cases. $30ish. 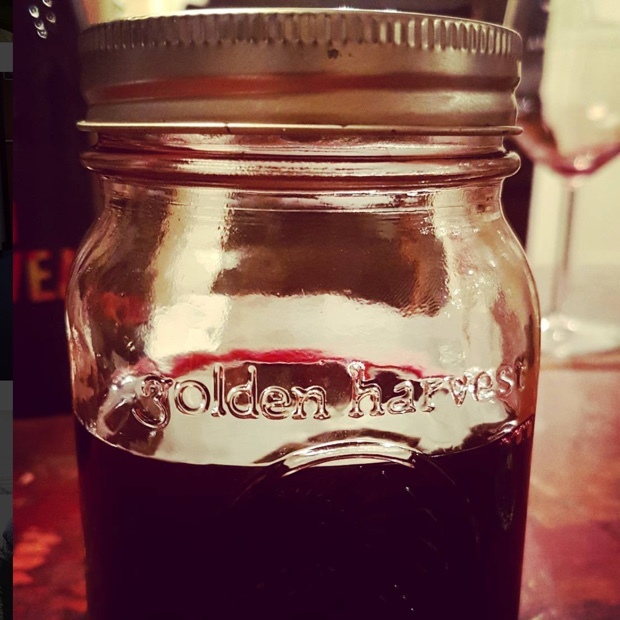 This extrospective @TrailEstateWine #cabernetfranc ’15 by @MackBrisbois…wait for it.